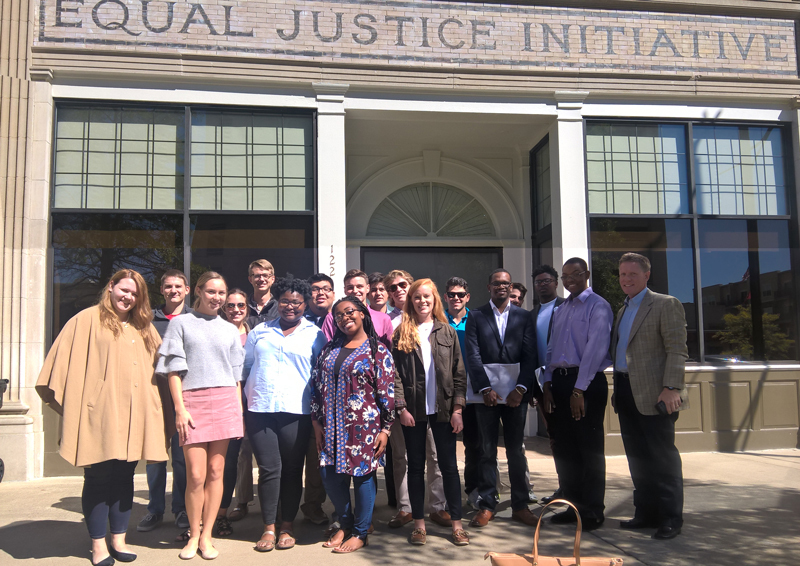 The Summersell Center for Southern History’s Public History Initiative partners students with on-campus and local organizations, such as the Gorgas House, W.H. Hoole Special Collections Library, and local churches and clubs, to conduct research and create projects that communicate their history to the public. For this internship, we are primarily working with the Jennie B. Scott Family Papers which are housed in the W.S. Hoole Special Collections Library. This collection contains an impressively consistent set of journals maintained by Mrs.Scott and various scrapbooks, books, and photos. Furthermore, there are materials from her sister, Rosa Lee, with whom she lived in Tuskegee after they were both widowed, and from her daughter Ruth. Mrs. Scott was a retired African-American teacher living in the South from the late-19th century through the mid-1960s. Her collection gives insight into middle-class African-American life and culture in the Jim Crow era. We have been tasked with exploring this collection and finding an aspect of it which we wish to highlight within an exhibit of our creation. Throughout our research, we noticed how her life, and the life of those around her, was shaped profoundly during the 1918 influenza pandemic. As a result, we have decided to focus on healthcare disparities in the African-American community during the Jim Crow era. 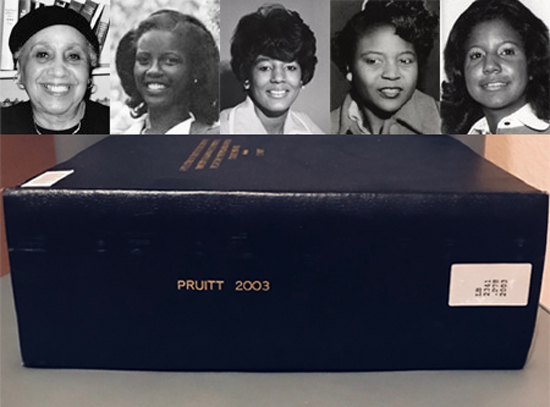 This semester I have been working at Hoole Special Collections with a team doing research on the Jennie B. Scott Family Papers, which includes items from an African-American Alabama family from the late-18th century to the mid-1960s. I’ve found looking at her diary entries to be particularly interesting because she wrote prolifically on a daily basis throughout her life and often on similar themes. You can compare what she found important during her early life with that of her later life. Later this semester our team will be using these sources to put together a display highlighting a particular facet of the Jim Crow South. The Summersell Center for the Study of the South’s Public History Initiative partners students with on-campus and local organizations, such as the Gorgas House, W.H. Hoole Special Collections Library, and local churches and clubs, to conduct research and create projects that communicate their history to the public. This year marks the 125th anniversary of Women’s admission at the University of Alabama. The admittance of women marked an important shift in the University’s history and its culture. The Gorgas House is in the midst of preparing an exhibition that commemorates and celebrates the impact of women on the University. Through an internship at the Gorgas House this semester I have been researching women’s sports at the University of Alabama and its role on campus from a historical perspective to be included in the exhibition. To research women’s sports at the University of Alabama I first began by looking at multiple sources from the Bryant Museum. Next, I examined a thesis written by a past graduate student addressing the integration of SEC sports to garner an understanding of the impact of integration on women’s athletics at the University. 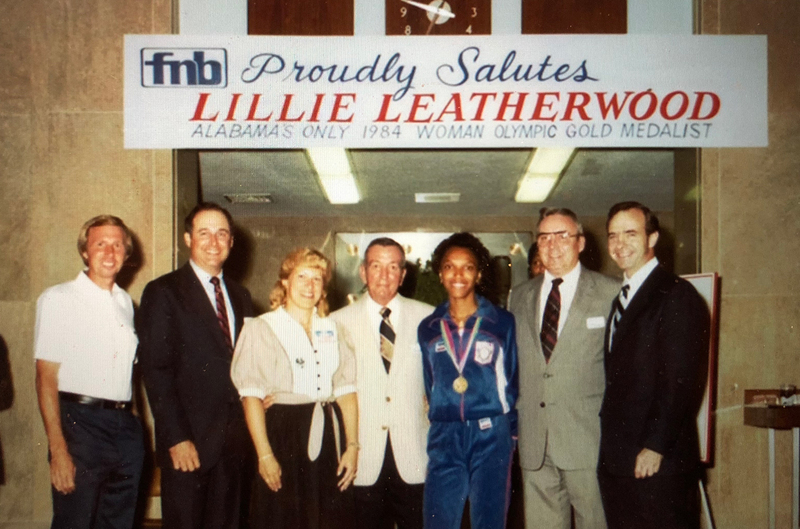 Finally, I have scoured online sources to locate photos and videos of past and present University of Alabama female athletes. Later this semester, we will be working on getting interviews with current and possibly past female athletes and coaches who have had a profound influence on women’s sports at the University. Through this research we will create an exhibit as well as a digital exhibit dedicated to the historical significance of women’s athletics at the University, which will be displayed in Gorgas House in conjunction with the exhibition of the effects of Women on campus in general. The exhibition, including my exhibit on women’s athletics, will be open to the public. On a personal note, this experience so far has been extremely beneficial and enjoyable, allowing me to gain an understanding of what type of work is done as a public historian. This internship has strengthened my love for history, provided valuable experience with conducting in depth research, and peaked my interest in trying my hand at being a public historian. Lillie Leatherwood, 3rd from right; UA President Joab Thomas, right. The Summersell Center for Southern History’s Public History Initiative partners students with on-campus and local organizations, such as the Gorgas House, W.S. Hoole Special Collections Library, and local churches and clubs, to conduct research and create projects that communicate their history to the public. I went on my first house tour when I was in the eighth grade. I toured The Hermitage in Nashville, Tennessee. I can almost remember every detail about that tour and was blown away by the fact that someone, albeit a very important someone, had their house turned into a museum. From that point on, it has been a wish of mine to be involved with a house museum of some sort. With that in mind, and knowing that desire was bubbling near the back of my mind, when the opportunity to work at Gorgas House in some respect presented itself, I could not help but jump at the opportunity! This was the opportunity I had been waiting for! However, that’s getting a little ahead of myself. In the fall of 2016, I found myself in the Public History course being offered by Dr. Giggie. I was interested because I had never really considered Public History as line of work. To be honest, I did not know what Public History meant. As far as I knew, it could have been a course on writing books that appealed to the public, hence Public History. Whatever the reason, it caught my eye. At the very least, I could add it as a line on my Curriculum Vitae. Besides, what could it hurt? After a session or two, I realized that Public History was really just the idea of how the public interacts with history, whether that be through museums, publishing, digital humanities, or archival work. I could see myself in any of those disciplines, but still in the back of my mind was this desire to work in a house museum. Then Gorgas House opened as a possibility. I was hooked. Now that I was on at the Gorgas House, the question turned to what I would make of my time there. When I had visited the house at an earlier date, I noticed that the mention of William Gorgas was contained almost exclusively to his time in the military. The remarkable thing is that Gorgas was much more than just a soldier. 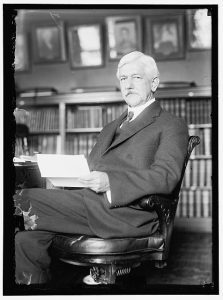 He oversaw sanitation in the Panama Canal zone, served as president of the American Medical Association, and most importantly was on the team that discovered that mosquitoes carry yellow fever! Yet none of this was being told. This rich history was shut up somewhere and I felt it my duty, if you will, to dig it out of the doldrums. 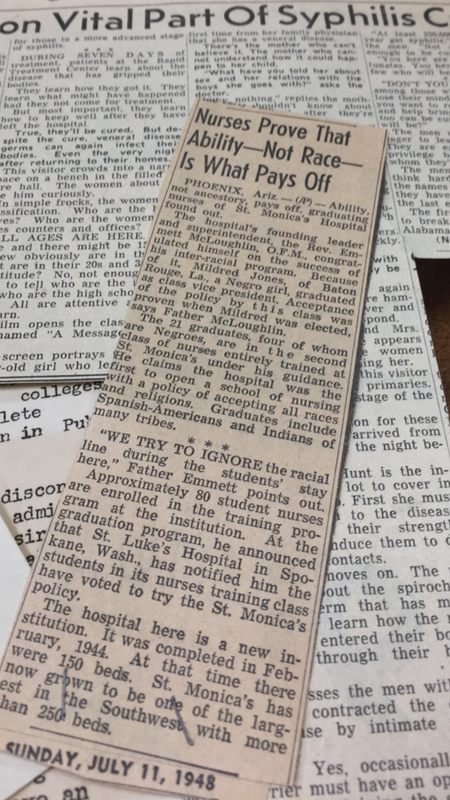 My hope is that by the end of my time at Gorgas House, there will be a fully functional, online exhibit tracing the importance in the medical field of a man whose only accolade on this campus is as Surgeon General. While this is a noble title and a singularly important position, it only tells a very small portion of the story. Lastly, having talked with Lydia Ellington Joffray, director of the Gorgas House, we both believe that this project is a great example of the mission of Gorgas House: to illuminate the lives of the Gorgas family and to educate people about this very important Alabama family. This project, as previously mentioned, will shine a light into the background of William Gorgas’ medical achievements. In the end, I am excited to have the opportunity to work with the house and Hoole Library in illustrating this man’s background and how important he is, not only for the University of Alabama or United States military history, but also his great impact in the history of medicine. Coat of Arms of the 167th Infantry Regiment, an Alabama National Guard unit. For the spring of 2017 I am working with the Gorgas House Museum to curate and display an exhibit commemorating the 100th anniversary of American entry into the First World War. I chose this internship to compliment my prior experience in military museums, as well as have the opportunity to serve in a “leadership” capacity during exhibit curation, which will afford me invaluable experience in the curation process. I picked the subject of WWI based on my prior experience of working with US Army museums, particularly research pertaining to the World Wars. Normally my focus has centered around logistics, and this internship is allowing me to expand on military operations, considering medical work as well as combat roles, and of course more logistics. By the end of the semester, I hope to have successfully curated and exhibited an intriguing collection of macro artifacts, photographs and documentation telling the story of the University, the state of Alabama, and the United States at war. I hope to gain firsthand experience in curation that I can carry forward into a potential museum career. The Gorgas House hopes to provide a valuable source of education into the role of Major General William Crawford Gorgas, the University, and the state of Alabama’s contribution to the First World War, highlighting a period of history that is quickly fading from public memory. the materials in the collection would give me the best experience for that type of work. Lewis and I met with Dr. Kate Matheny, the Reference Services and Outreach Coordinator for Special Collections at Hoole, in mid-December 2016 to discuss what materials are available to work with. She presented us with three ideas. First, was an exhibit on industry in Birmingham using the Woodward papers and the Working Lives interviews. Second, was an exhibit using papers from a Harvard psychologist who used and experimented with LSD. Finally, she indicated that Hoole had a collection of old church hymnals. We decided that the Birmingham project would work best because of the interest it would have to the local population and a wide audience. Having looked through much of the material, Lewis Whilden and I are going to create an exhibit displaying a “Day in the Life of a Miner” with focus on the types of work available, how much miners were paid, how miners used strikes and membership to labor unions to leverage pay and benefits, what kinds of risks were involved in mining (including accidents and health risks), and what miners did for entertainment (including baseball). 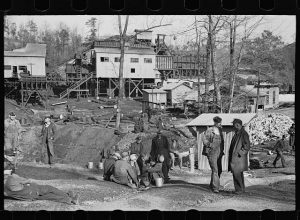 In looking at these aspects of miner’s lives we will also have some focus on race relations and segregation since race affected what kinds of jobs one could get and thus how much one was paid. From this experience I would like to gain a better understanding of the process of creating exhibits in museums and libraries. I hope that this will make me better able to read displays and exhibits when I go to museums in the future and will cause me to think more about what went into creating these exhibits. Finally, I hope that this experience will help me to be a better communicator since I will not be able to explain my findings in pages worth of print but instead must condense my findings into comprehensible snippets in a display case. Our creation of this display furthers the mission of Hoole because it advertises to the public what is available in their collections. Several research papers could be written from the information in our exhibit. Further, one of Dr. Matheny’s goals is to have a well-researched academic exhibit displayed. 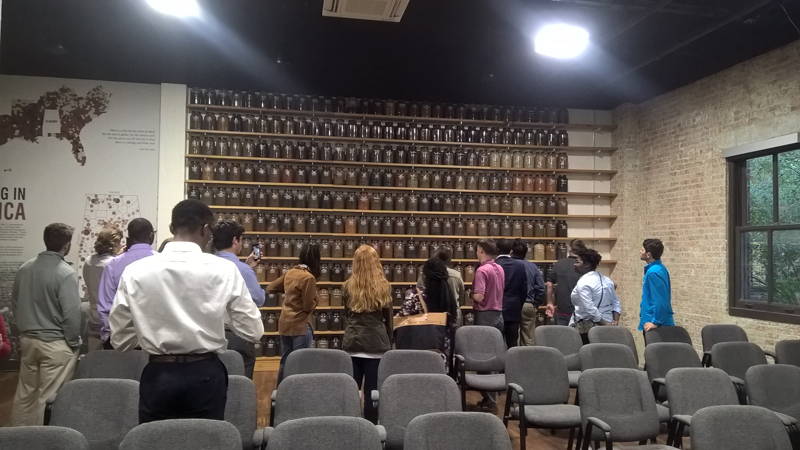 This showcases how students in particular can use the library’s materials and can help get people into the library to use such material available in their collections. I became interested in this project because of the time period spanned by the Church. The Church has its beginnings in some very unique times in American history. Not only was it a product of the second great awakening, but it also comes about during Alabama fever, and the establishment of a slave economy in what was then the American Southwest. Early America through the Civil War is my area of interest, so this project provides a chance to really examine these times on a local level. I am particularly interested in seeing how the Church reacted to the Civil War itself. The University was essentially an officer training school, and members of the congregation almost undoubtedly fought for the South. It would be great to know who went, and why, and how the congregation dealt with the war. How did they feel about the cause? Were they pushing for secession beforehand? Was the Church political at all? As for this semester, I plan on working mostly with the Church’s roll book from the 1830s. This is an amazing primary source document that could really shed light on who attended the church and what their lives were like. I would like to try to match the names to census records and tell some of the biographical stories of these early members. Additionally, the book can serve as a great view into the world of antebellum religion. The Church had slave members and they are listed on the roll. What was it like to be in the Church then? How did things change post-Nat Turner? What was the socio-economic status of the people in the Church, and how did they interact with each other? The court cases also give insight into the nature of the law in what was still largely frontier Alabama. The book as a whole is a tremendous piece of information, and it will be harder to narrow down options than to come up with them. I really would like to build research skills during this project. The book will require some archival research to be sure, and the sources might be scant. It will be a challenge to synthesize these stories with the little information I will have. I also want to work on writing for a lay audience. Most people will not care about the broader historical implications, but they will want to feel connected to their Church ancestors. I want to be able to connect with them in a way that will leave a lasting impact. Ultimately, that is the goal for the whole project. I want to situate the Church of 1831 with the congregation of 2018. This is their history, and it is my job to help them learn and understand it. They have given us free reign with the project, and I would like to see it be something they will reference and something that will anchor them in the past as they look towards the future. I want the average Church member to feel a connection with the past, even if they do not fully understand the full historical context. Tuscaloosa Police and Sheriff’s Deputies Arrest a Demonstrator. Photo Courtesy of the Tuscaloosa News. This spring, I am participating in the Civil Rights Commission internship, which involves gathering and compiling information on civil rights in West Alabama. I chose to work on this project because I want to learn more about the rich but often underestimated civil rights events and legacies of the Tuscaloosa area. While American history and civil rights are not subjects that I have formally researched in recent years, I have a very personal investment in these topics on the local level. 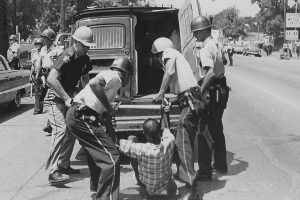 Members of my family have called the Tuscaloosa area home for at least four generations, and some were involved in events like Bloody Tuesday when marchers were beaten, hosed, and tear-gassed by policemen in 1964. Many of them still live here, and embarking on this internship has already inspired me to ask more questions about their viewpoints and experiences. The current political climate has also sparked a renewed interest in the issues of equality and progress, and motivated me to look back in order to understand and process recent events and debates. As a public history intern, my current task is to research three sites: Greenwood Cemetery, Dinah Washington Cultural Arts Center, and the Alabama Citizen and its building. I will be describing their origins, their roles in the community, and their ties to the Civil Rights Movement. These sites, along with ones like the Alston Building and First African Baptist Church researched by my fellow interns, are intended to become stops on the future Tuscaloosa and West Alabama Civil Rights Tour. I am excited to help build an experience that will bring parts of a fascinating and important history to life for both locals and outside visitors.